The 230 Volt Euro socket can only be used when the ignition is on ⇒ . 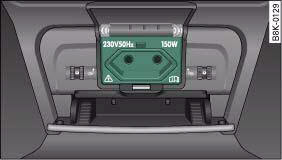 • If the power drawn by the connected appliances is above 150 W, the inverter in the socket will get warm. The inverter will trip out if the temperature exceeds a certain limit. The inverter can trip out on hot days even when an appliance with a suitable power rating is used. The inverter will switch on again automatically after it has cooled down. Appliances which are already connected and switched on will be activated again automatically ⇒ . • Do not connect 115 Volt appliances to the 230 Volt Euro socket. This may cause irreparable damage to the appliance. Check the type plate on the appliance if you are unsure of the voltage rating.